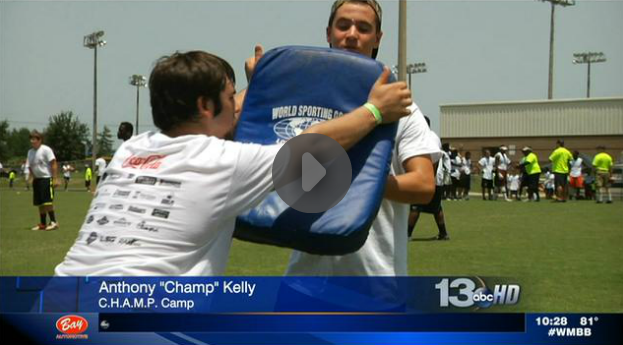 In 2010 Anthony Champ Kelly returned to his Alma Mater of Graceville High School for the Panhandle’s first ever C.H.A.M.P Camp. Four years and over 200 kids later the camp made it’s return Friday at Bozeman for day one of the two day annual camp. Close to 300 kids from ages 10 to 18 made the trip to Deane Bozeman school for the camp. The guys took part in various drills to start the day off capped off by some seven on seven action in the afternoon. Champ is a former Tiger and Kentucky stand-out, but his camp preaches more then just the fundamentals of football. It also stresses character, heart, attitude, motivation, and pride in hopes of making the kids better people along with football stars. Champ, who is happy to be back in his home state, is even more happy to give back to his local community. The 5th Annual C.H.A.M.P Camp wraps up Saturday at Bozeman.